We don’t have a blender. We did, back in our last days of house-owning. And sometimes we would make smoothies or some frozen concoctions. There was a time, before, when I eschewed electrical appliances. First, it was a long time ago. We were starry-eyed and idealistic. Communes were hip, May Day was still a happening thing on campus, and we felt mega-business was bad. We believed apocalypse was entirely possible or even likely in our young lifetimes. My first fiance and I decided we wouldn’t be contributing any more than necessary to the coffers of big business and the energy companies. We requested, for our wedding presents, to have no appliances. Someone still gifted us a lovely little toaster and the local department store graciously took it from us for store credit. We probably bought sheets and towels with the credit. But no appliances, save our decades old waffle iron, would decorate our kitchen. Now decades and a happier marriage later, we are again eschewing appliances. Who needs ’em, anyway? 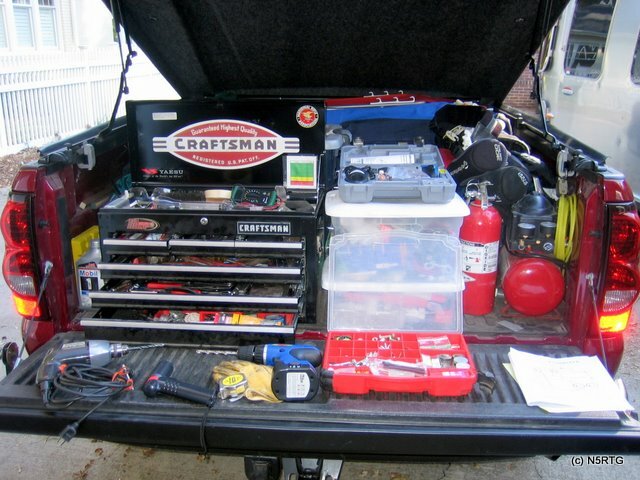 I’d rather have cool tools to improve, maintain, and repair our truck and trailer. Appliances take up space, mostly won’t operate on our home’s 12vdc system, and provide little improvement to our lives. Well, for the most part anyway. Last week we enjoyed co-hosting a daiquiri party. Jennifer and Brad at Minnesota Airstream Park offered their wonderful gazebo, ringed with happy face string lights. We brought mixers and a bottle of Cruzan dark rum, cask aged 2 years and we aged it 8 more years in the bottle. This bottle was our last of six or seven from our honeymoon in St Thomas, V.I. Robert, their good friend, scavenged up an electric blender. This party would NOT have been the same without a powered blender. The blender made frozen daiquiris, a real treat, without any fuss. Without the blender we would have daiquiris on ice. Just not the same. Let me be perfectly clear. We can have appliances without 110vac electrical power. Just to quickly name a few, there is the Daiquiri Whacker, and the passive solar ovens, and most important of all, the Food Saver. Whoops! The last one does require 110v power (just a little). Okay, where’s this post going? After the daiquiri party last week I feel compelled to reconsider my stance on needed appliances. You already know we are full-timing in a pretty compact platform. Our Airstream trailer is called a International CCD 25. Our big red truck is a Chevy Silverado 2500HD. So the trailer has nice places to store things but only 558 pounds net carrying capacity (excluding propane and water). The truck can handle all the weight we want to throw at it, but a short (6.5 ft) bed. So we cannot carry very many things, much less bulky single-purpose appliances. We carry an electric blender. Deb uses it for an occasional coffee cake, so it’s worth whatever space it takes. We have a little ceramic heater. We have a Toaststation, a sort of combo toaster and munsey toaster oven. We have a Foodsaver. You may know Foodsaver it by other names. It vacuums and seals plastic bags with leftovers or other fresh things. Far and away we use the Foodsaver more then the others. Our bulk green tea goes into vacuum sealed bags. Fresh or frozen chicken or fish we put into a plastic freezer bag with 1/4 cup of marinade and vacuum seal it before refreezing it until ready to thaw before grilling. And some seeds, nuts, and grains do really well with vacuum sealing. Ahh, I’ve strayed. I was talking about daiquiris and Robert turning up a blender and our party at Jenn’s and Brad’s. We thought it would be a really good idea to reduce our on-board stash of spirits before we approach the Canadian border. Gosh, had we looked up the limits for entry to Canada we would have either had a really bigger party or would have partied successive nights. Our party with Robert, Brad, and Jen and their friends was a lot of fun, though. And we enjoyed our entire stay at Minnesota Airstream Park. Now, a few days later, we have consulted the website for Canada border entry. We are allowed 1.15 litres of spirits, or a couple of fifths of wine, or a case of beer. Any more and we are required to declare and pay duty upon the extra. We are pretty straight arrows and don’t want to raise suspicions of any kind. But they’ve never even asked us about on-board alcohol in our previous crossings. Still, it’s fun getting ready. We’re reducing our tequila bottle volume tonight. Last night we went through some Johnny Walker Black, to reduce by one the number of bottles we’ll have when we arrive at the border. I have a couple of beers, but am running out of time. I want to save them anyway, their pretty nice. And I don’t buy this stuff to rush through it. Heck, that’s why I had six different bottles. It’s not like I had it in my car trunk — it is my entire liquor cabinet. Their limits don’t seem to account for people pulling their home (and wet bar) through the border. Back to appliances, though. The mixer seems like a good idea — it makes desserts and doesn’t take any space in the RV. It lives in a nice box in the truck bed. The FoodSaver is singularly the most used equipment item and happens to fit snugly under the kitchen sink in a four inch tall shelf. The toaster is lately appearing to be toast — a has been. We have started toasting bread on the skillet with olive oil or butter. You can’t beat this as a complement to a great dinner or breakfast. Who needs a toaster anyway? But maybe we could find a place for a good blender? Maybe someone has designed one to be driven by our mixer? Nah. Besides, the rum is gone. It was a lot of fun making a couple of batches of daiquiris in Robert’s scrounged blender in Brad and Jen’s really cool Airstream and sharing them with whomever cruised in for the party. Besides, we can always scrounge a blender from someone in a big fifth wheel or an Airstream 34 foot trailer. They have so much space they probably have all the appliances. We could have had the appliances, but we have a bunch of tools instead. And that is another story entirely.